Four years after his death in Paris at the age of 84 and years after the peak of his popularity, Marcel Marceau, the greatest mime to grace the stage and screen, is being celebrated by the Jewish press as a new biography of the silent one reaches bookstores this week. Marceau, who created an alter ego of Bip the Clown, was inspired by Charlie Chaplin and his alter ego, the Little Tramp, and comic actor Buster Keaton. As a teenager in wartime France, Marcel Mangel helped fight Nazis in unusual ways--he doctored the passports of Jewish children, making them seem younger so they weren't sent to labor camps. He also dressed up groups of children as boy scouts and led them on "hiking expeditions" along the French-Swiss border, smuggling them to safety. Even as his father, a kosher butcher, was deported to Auschwitz, Marcel joined the French Resistance and continued to fight the occupation. It was around this time that he changed his last name to "Marceau," taking the surname of one of the generals of the French Revolution. 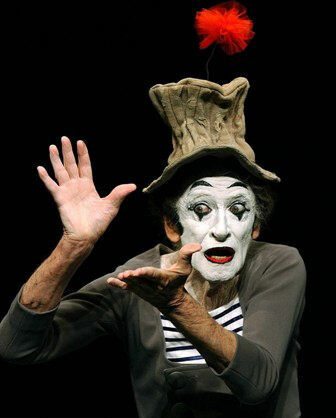 Marcel Marceau became the world's most famous mime, appearing frequently on variety shows and performing for world leaders. He also had the only speaking part in Mel Brooks' film Silent Movie--asked whether he would audition, he said, "No!" A new picture book, Marcel Marceau: Master of Mime, tells about his life in a way that's sensitive to children but doesn't shirk from the seriousness of his story. Here's the scene from Silent Movie, which also starred Sid Caesar, Marty Feldman, Dom DeLuise, and Bernadette Peters. Enjoy!